Why a Grabber? Who needs one? The VocabGrabber brings new magic to an already magical site allowing the visitor to mix up a great stew or gumbo of words that combines tastes, flavors and meanings without individual tastes being lost in the process. As I explained in that article, if our brains are filled with simple word lists, we are likely to see things in simple terms and respond a bit too readily to those who give us simple answers to complex problems. Web-based resources like the Visual Thesaurus support a kind of playful exploration of meanings that can enrich and expand vocabulary dramatically. I wrote that article before I became aware of the VocabGrabber - a new tool that expands the power of the original. To show the power of this tool, I pasted a paragraph from this month's companion article into the text box of VocabGrabber and the results appear below. You can enlarge this image by clinking on it. Of course, there is wisdom in the expression "seeing is believing." 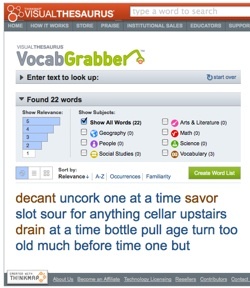 The magic of VocabGrabber is best seen online, as it is the dynamic qualities of the tool that win my praise - the ability to play with the words and explore their meanings in a playful manner is poorly captured by a screen shot. Truthfully, one must go to the site and enter a poem or passage of one's own to see how this works, but I will point out several features that I find especially appealing. The key words from the passage are gathered at the bottom in a cloud that uses colors to code the categories into which each word fits. 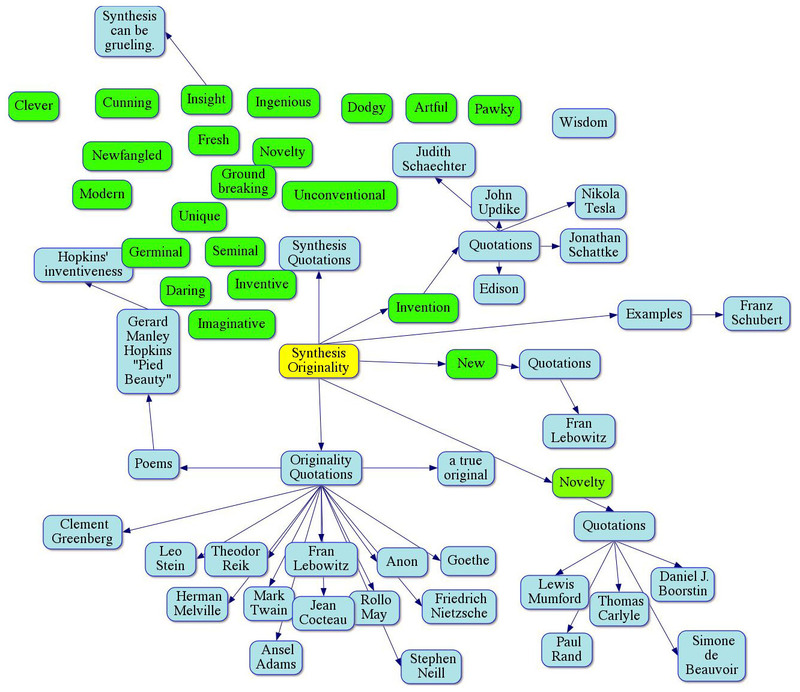 The first word in the list - "taxonomy" in this case - is shown in the upper right corner as a cluster diagram with related words and definitions. 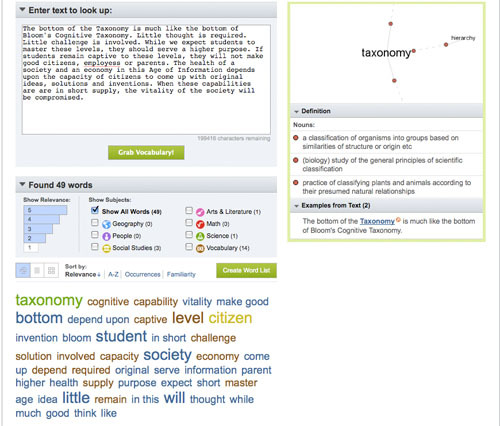 The user can click on any of the words in the box and its cluster will appear to the right along with its definitions. 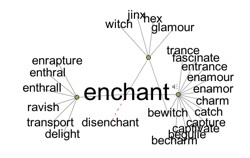 This makes for extremely rapid and user friendly searching of word meanings in a difficult passage. Imagine looking up all those words in a conventional print dictionary or encyclopedia! Time consuming and awkward. 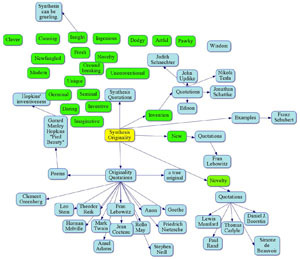 The user can select from three buttons above the list of words, one of which will display a miniature cluster diagram for each of the key words in a scrolling display below. This makes it possible to see at a glance those words with the most complex array or related words and allows for quick browsing. If you click on any of these clusters, en enlarged version appears in the upper right corner. 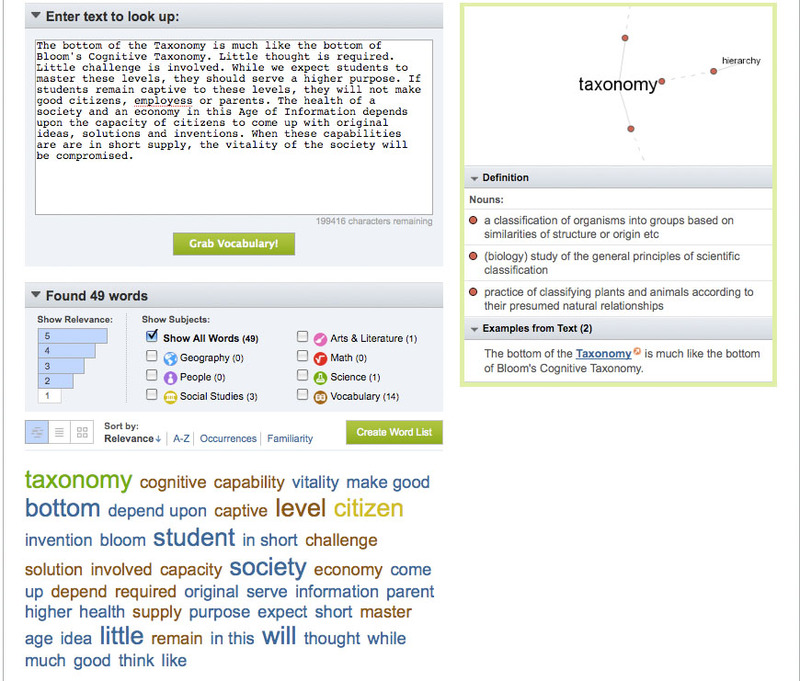 At any time you wish to explore a concept in the full version of the Thesaurus, you click on that word in the small diagram in the window to the right and a new Java window opens with that word in the center. VocabGrabber represents a different way of reading a passage - one that is rich in meaning, especially for those who might not be familiar with many of the key concepts. Give it a try! 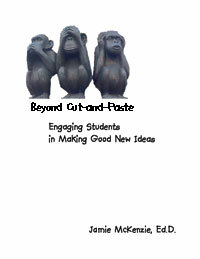 New McKenzie book arriving in June. Save 20% by ordering now.